In a career spanning in excess of 52 years, Peter Collins has focused on helping and bringing out the best in others – whether they be individuals, SME (Small to Medium Enterprises), medium and small business owners or those that work within the corporate sector. Over that time Peter has concentrated on specialising in four separate business sectors. As a career Sales Consultant and Sales Manager, Peter has only worked for two multi-nationals and yet achieved hall of fame status in both (twice with one). His work also involved specialised Sales Development Consulting and Sales Processes Evaluation to the Corporate sector, Medium and Small Business enterprises and has given his time freely to Charities, Church groups and Associations. As a Marketer, Peter has worked with award winning Australian-born International Marketer Bob Pritchard (who consults to 83 Fortune 500 companies). Peters work with Bob included Sales Process Creation, Copy-Writing, Yellow Pages Advertisement Creation / Copy-Writing and the Development/Execution of Specialist Marketing Seminars. Bob has also edited and collaborated in a number of Foundational Marketing concept documents and books Peter had created on behalf of clients. 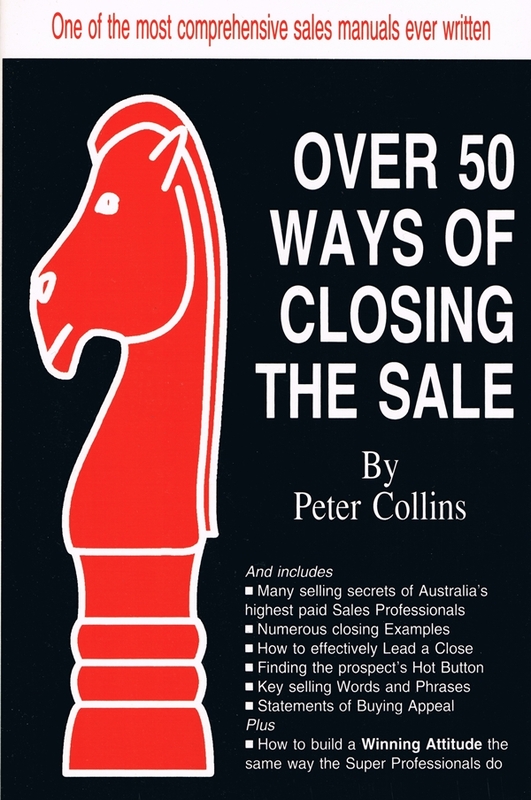 Although Peter has built a reputation as an Internationally Published author since the 1980’s and has to his credit, he is mainly known for one book based on the Audio Tape series of the same name, entitled Over 50 Ways of Closing the Sale. He is also the creator of 7 Audio Tape Sets, 5 licensed Corporate Seminars, 5 licensed Small Business Seminars, and over 50 Flexible Sales Modules. In addition, he has had over 2,500 articles published in Newspapers, Magazines, Circulars and Social Media; appeared on Television (started on Black and White TV), AM Radio, FM Radio and Video; and has worked as a Seminar Presenter, Corporate Trainer and Key-Note Speaker since 1977. He has also spoken in the Great Hall, Parliament House, Canberra, Australia, and Parliament House of New South Wales, Australia, on a number of occasions. For more that 35 years now, Peter has developed as a local, national and international Corporate Consultant with expertise in personalised Business Marketing, exclusive Sales Acceleration programs, unique Management Process training and Seminar Presentations. In his personal life, and among Christian communities, Peter has been sought after as an encourager, motivator and mentor, that has given of his time and talents freely despite his busy schedules over the years. Subsequently, he has assisted churches, pastors, community and charity groups, as well as individuals through his teaching, training, development and on-going mentoring. Peter has also provided these groups with a diverse range of especially written encouraging articles, quotes, newsletters and a variety of other written material that has been used in newspapers, magazines, newsletters and personalised websites to help promote churches, fundraising activities, political help as well as specialized marketing campaigns.